Up till now I’ve been demonstrating some of the different different methods that can be used to add metadata and use this to sort and display your music library. Now I would like to show you a demonstration of why getting all of this metadata correct is important. Think of your iTunes library as your ILMS. If you don’t have the right data, you can’t find things, you can’t make accurate reports, you can’t do visualisations or data analysis etc. Let’s take a look at smart playlists. Smart playlists are automatically generated playlists that adhere to a certain set of rules that you configure. They can be simple or they can be complex, but they’re actually quite useful. Imagine I’m holding a theme party & I want to make up a playlist of tunes to play. The theme is the 80’s so I want to play pop songs from the 80’s that begin with L (it might be a very short party). That’s pretty simple to do & in no time I have my party tunes set up! In 2017 there’s a bunch of really good albums that are having a significant anniversary since their release: Sgt Peppers, Rumours, Exodus, Sign ‘O’ the Times, Kiss Me Kiss Me Kiss Me, Document, Appetite for Destruction, The Joshua Tree, OK Computer. Let’s set up a smart playlist to display songs that were released in a year ending with 7. I have a whole list of smart playlists that display tracks from a certain year. This is really easy to create. Go to File > New > Smart Playlist. In this case, it’s a pretty simple query. 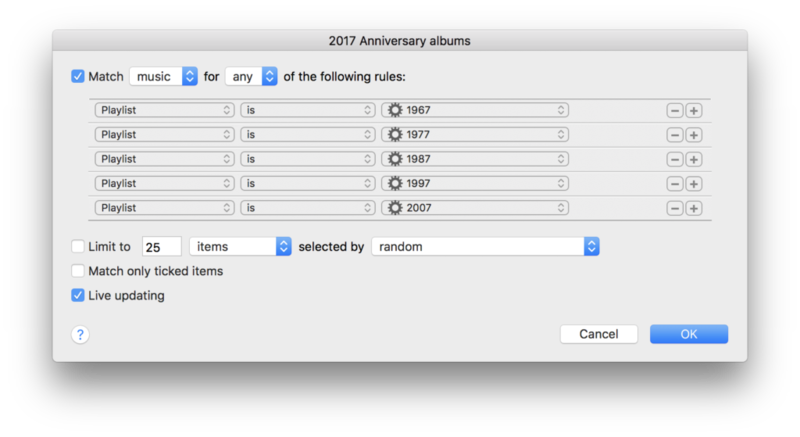 Once I have a number of the playlists of individual years, I can create a new smart playlist that uses a combination of nested playlists as it’s query parameters to generate the final result (like a nested SQL statement). Here we’re grabbing all the tracks just from those particular years. Now we have a list of all the albums/tracks that are having an anniversary in 2017. This entry was posted on Saturday, June 10th, 2017 at 8:00 am	and is filed under Apple, Music, Tutorial. You can follow any responses to this entry through the RSS 2.0 feed. Both comments and pings are currently closed. You know up to now I had just thought these posts were for ultra organised people. But now I want to do it so I can play myself all my 8’s songs starting with L – just for fun! There’s a good reason to being ultra organized!